The poppy was chosen as the symbol of remembrance as it represents life and hope. In Flanders the poppies grew because their seeds can lay dormant for years until the ground in which they rest becomes disturbed. The fields of Belgium and Northern France were, sorrowfully, to become ideal conditions for these poppies. Among the blood and battles the sight of the poppies offered reassurance to those still fighting. The vision of these poppies inspired a young Canadian airman, John McCrae, to pen the now famous poem In Flanders Fields. The poppy was adopted by the British Legion in 1921 and the Poppy Appeal was born. 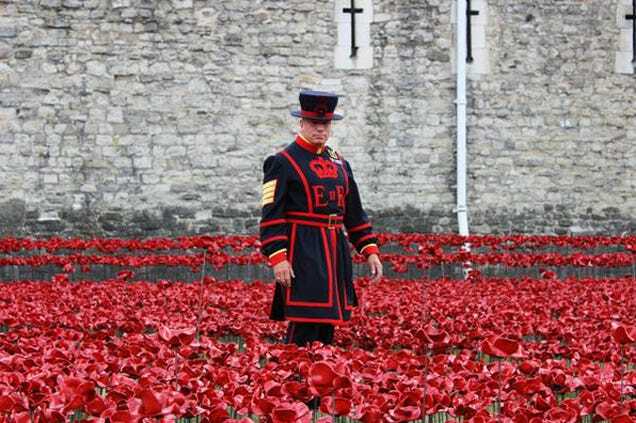 A Tower of London Guard amongst this year's stunning memorial poppy display. Image via. The second Sunday in November has become what is known as Remembrance Sunday. This year’s Remembrance Sunday falls on the 9th November. It is marked by a parade and wreath laying ceremony at the Cenotaph in Whitehall, here in London, as well as observances throughout the country and the world. Having a look around the shop at a few military items we have, I came across a field cannon on wheels mounted on a pedestal. The model of the gun on top of this plinth is that of a QF 13 Pounder which was the artillery used in battle by both British and Canadian troops of the First World War. Click here to view on our website. The V Brigade RHA was part of the Royal Horse Artillery which served with the 8th division on the Western Front. During these operations Lieut. Kentish was a BSM, Battery Sergeant Major, meaning he was a warrant officer and subunit commander. This would have meant he would have been responsible for leading up to 30 soldiers in training and operations. During his commission in France, BSM Kentish would have seen some of the bloodiest battles of the war. He must have witnessed some unimaginable things. Fortunately, 2nd Lieut. Ernest George Kentish made it home after two years on and around the front line. One can only hope he went on to have a long and fulfilling life. He must have been a respected and admired member of his battalion, as his fellow soldiers chose to honour him with this fitting tribute. So come the 11th of November, whilst observing the two minute silence, I will be thinking of Ernest Kentish along with the hundreds of thousands of others who risked all in the ongoing battle for liberty. On a closing note, if you happen to be in London I thoroughly recommend you get down to Tower Bridge and view the sea of poppies cascading from the Tower of London. By Armistice Day there will be 888,246 of them. One to represent each of the fallen British and Colonial soldiers of the First World War. A beautiful and moving tribute.